The Store in Windows 10 won’t open? Windows Store apps not downloading or updating? So if you’ve been facing this issue, let see how you can fix it easily and get Windows 10 Store back to work. Press the Windows key + R to open the Run command box, or open the Command Prompt as administrator. Type wsreset and press Enter. After a few minutes, all Store cache and corrupt settings are reset, and your Windows Store shall open normally. Note: Replace user_name with the name of your Windows account. By default, the AppData directory is hidden and you need to set Windows to show hidden files. Type powershell in the Cortana search box on your taskbar. 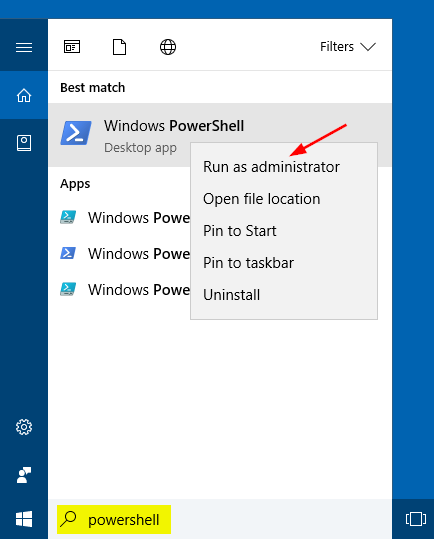 Right-click on the Powershell app from the result, and choose Run as administrator. In the administrative PowerShell window, paste the following command and hit Enter to re-register the store apps. Once the command is successfully executed, you can close Windows PowerShell. After restarting the system, problems with Windows 10 Store should be fixed. Microsoft has a troubleshooter that scans your system and automatically fixes any problems that might be preventing any Windows Store apps from working correctly. Windows Store Apps Troubleshooter isn’t built-in to Windows, you can easily download it for free from this link.